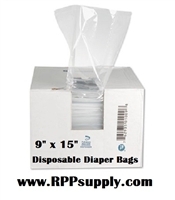 FREE SHIPPING on Disposable Plastic Diaper Bags. Great for Keeping down the Smell of Dirty Diapers. Use these disposable plastic diaper bags to put the dirty diaper in. Disposable Diaper Bags used for Dirty Diapers or soiled clothes. These disposable diaper bags are bulk flat pack. Disposable Diaper Bags are used to keep the smell & odor down in the Trash Can. Simply put soiled Diaper in the bag, and tie it off, and throw in garbage.